In its first season back as a KSHSAA football school the Central Christian Cougars are in the playoffs. Central Christian played club football for several years before becoming eligible for the state playoffs again this season. The Cougars qualified for the playoffs for the first time since 1996 with a 58-12 win over Caldwell on Thursday night. It was a billed as a match-up of two of the top scoring teams in the state regardless of classification. Central Christian averages 63.3 points per game, while Caldwell entered averaging 61.8 points per game. Five starters missed the game for the Blue Jays for disciplinary reasons. Cougar quarterback Nate Heneha completed six of eight passes for 118 yards and three touchdowns in the win. Heneha also rushed for 105 yards and two scores. Logan Miller had 76 yards rushing and two touchdowns, and caught three passes for 65 yards and two scores. Central Christian’s reward for reaching the postseason is a trip to Lebo (7-2) on Tuesday night. The Wolves’ two losses have come to ranked 8-Man opponents. Lebo opened with a 22-0 loss to Hanover (8M-II No. 1), and dropped a 46-0 decision to Burlingame (8M-I No. 3) back in Week 3. Senior Drew Ott directs the Wolves’ offense from his quarterback position. Ott has completed 55 percent of his passes for 1,005 yards and 14 touchdowns in eight games season. Ott has also rushed for 350 yards and five scores. 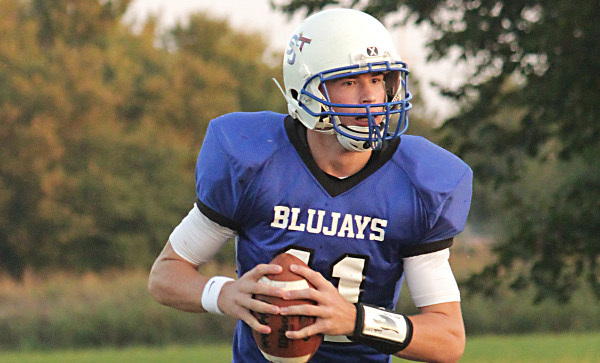 The senior passed for a season-high 249 yards in a 34-26 win over Waverly back in Week 5. Brian Reese leads Lebo’s ground attack with 648 yards and 16 touchdowns. He has rushed for more than 100 yards in each of Lebo’s last four games. Peyton Baldwin has 39 receptions for 587 yards and nine touchdowns, but stepped in at quarterback in Ott’s absence in a 32-26 win over Pleasanton. Baldwin passed for 127 yards and two scores and rushed for 92 more yards in that game. Hudson Doudna has added 21 catches for 362 yards and five scores. Both teams graduated large senior classes but are back in the playoffs with very similar statistical profiles despite the varying records. Chase is ranked No. 14 with the No. 13 strength of schedule in the classification, according to Prep Power Index. Ingalls stands at No. 16 with the easiest SOS in the 49-team classification. Ingalls went 10-1 in 2014 and 9-2 last season and returned quarterback Colton Schmidt for first-year coach Vestal Teeter. This year, the Bulldogs went 8-1 with a key non-district 44-36 victory versus eventual 2-7 Kiowa County, and then an early district 62-58 win against Minneola that essentially clinched the district title. Ingalls averaged 59 points a game in 2015 and is at 57 a contest this season in eight contests (Ingalls won a game by forfeit). Chase had back-to-back perfect regular seasons in 2014 and ’15 only to lose in the first round to Pike Valley both times. The program graduated standout quarterback Brandon Clark and lineman Riely Munoz. The Kats are 0-5 in the postseason since 2010 and have won playoff games just once in school history with a surprising runner-up finish in 1986. Chase has 15 players with five seniors, including Justin Oberle and Kebren Julian. Chase opened 0-3 but defeated then-unbeaten Sylvan-Lucas Unified in Week 4 and suffered just a district loss to South Baber. Against the three best teams on its schedule, Chase permitted 56, 54 and 58 points. Both teams allow more than 33 points a contest, but Ingalls is more explosive. No. 5 Sharon Springs-Wallace Co. (6-3) at Stockton (4-5) – Sharon Springs-Wallace Co.